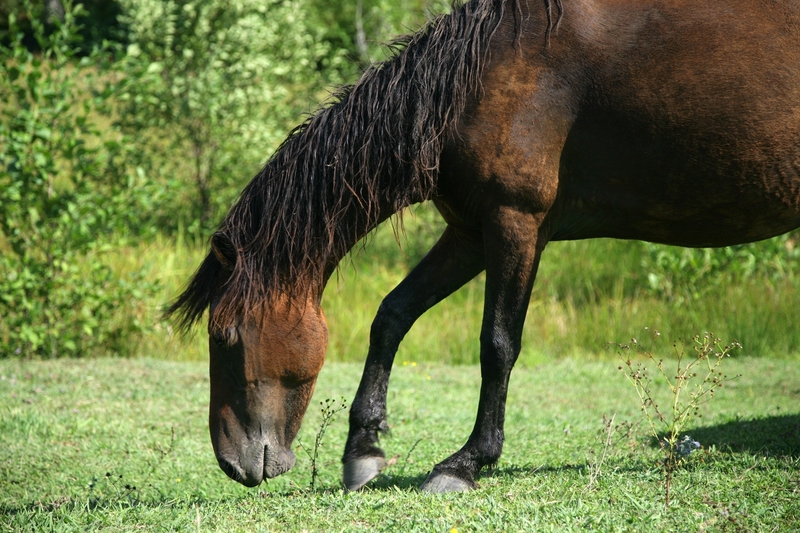 What is Equine Cushings Disease? Geez, I can’t remember ever hearing the word Cushings back when I had my big barn (well, it was 25 years ago but still!). Now days, whether it’s due to how we manage our horses or something else, Cushings is a common condition. 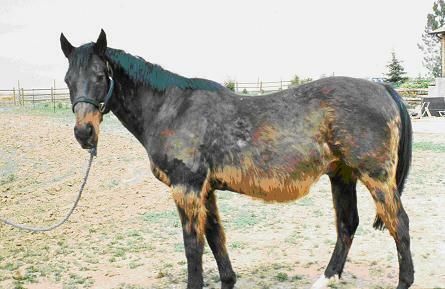 Equine Cushings Disease (ECD) also known as Pituitary Pars Intermedia Dysfunction (PPID) is caused by dysfunction of the pars intermedia of the pituitary gland. This is unlike Cushings disease in other species in which either the pituitary gland or the adrenal gland may be affected. Due to this species difference, experts prefer to call this disease Pituitary Pars Intermedia Dysfunction (PPID). The pituitary gland is a small gland in the brain that is responsible for controlling many metabolic functions in the body. When it is functioning normally, the pituitary gland signals the adrenal glands (tiny glands located by the kidneys) to produce healthy amounts of cortisol. Cortisol is a natural version of steroids such as prednisone and dexamethasone and is known as a stress hormone because normally it is released in response to stress With ECD, excessive amounts of cortisol are produced, which results in a variety of possible clinical signs. ECD is usually seen in older horses and there is some support for the view that obesity and insulin resistance might contribute to PPID development. ECD has been found in younger horses however so current research is focused on the way we manage our horses with the use of high sugar/starch diets and physical stressors, such as excessive work, confinement and vaccinations. These stressors can lead to an imbalanced hormonal response which can result in elevated cortisol secretion, insulin resistance, and laminitis. What Are The Signs of ECD? 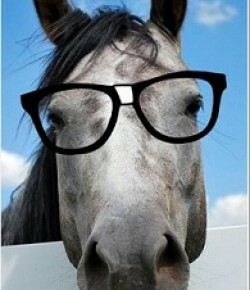 Your veterinarian might make a diagnosis based on your horse’s history and physical exam findings alone. However, it is more definitive to use one of the blood tests available along with history and clinical findings to make a positive diagnosis. Testing for ECD is usually either an endogenous ACTH test or a low-dose dexamethasone suppression test. Both tests should be done in a low-stress situation as stress can artificially raise the levels and give a false positive result to the test. When testing from August – November a higher reference range for these tests must be used as all horses have natural increase in these levels during the fall months. Unfortunately, there are horses that elude diagnosis despite the best clinical efforts. This is frustrating for the owner and the veterinarian. What is the Prognosis for a Horse with ECD? Best Case: For most horses ECD is very manageable. The drug Pergolide is the mainstay of treatment, but sometimes the drug Cyproheptadine is also used. Cyproheptadine is generally not as effective in managing ECD when used alone so it is often used in conjunction with pergolide. Bad Case: Though ECD is treatable it is not curable and these horses need daily treatment to manage the disease. The disease in some horses will become resistant to treatment, requiring an increased dose of pergolide or pergolide + cyproheptadine to control symptoms. Worst Case: The worst consequence of ECD is laminitis. Laminitis is a disease involving severe inflammation within the feet. It can range in severity and each case is different, but it is the number one reason horses with ECD are euthanized. If you and your vet suspect your horse might have Cushings despite lab results, or if you have a horse that has a positive lab test, there are management practices that can help. Proper nutritional support including diet and supplements can go a long way in helping a horse with ECD. What Are The Nutritional Concerns For ECD? These horses are often insulin resistant and have high blood sugar levels so non-structured carbohydrates (NSC) need to be avoided. 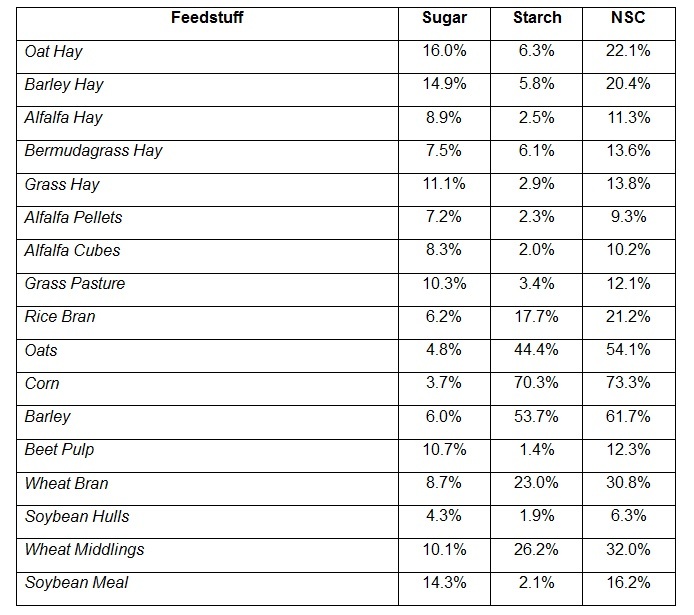 All feedstuff should be low in soluble carbohydrates-sugar and starch (NSC). 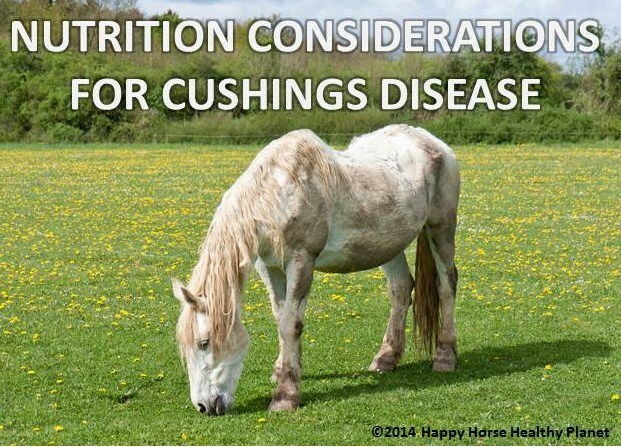 Feeding recommendations are to provide a total diet with less than 20% NSC for most horses with Cushing’s disease although some horses and ponies may need a dietary NSC level of less than 10% to avoid excessive complications. Here is a chart with the NSC values of common things in an equine diet. You can see that it can be difficult to reach that low level for a daily intake. So let’s start with pasture…. Common pasture grasses can have a high NSC content, especially during the spring and fall seasons, so pasture grazing should be severely limited or totally avoided. 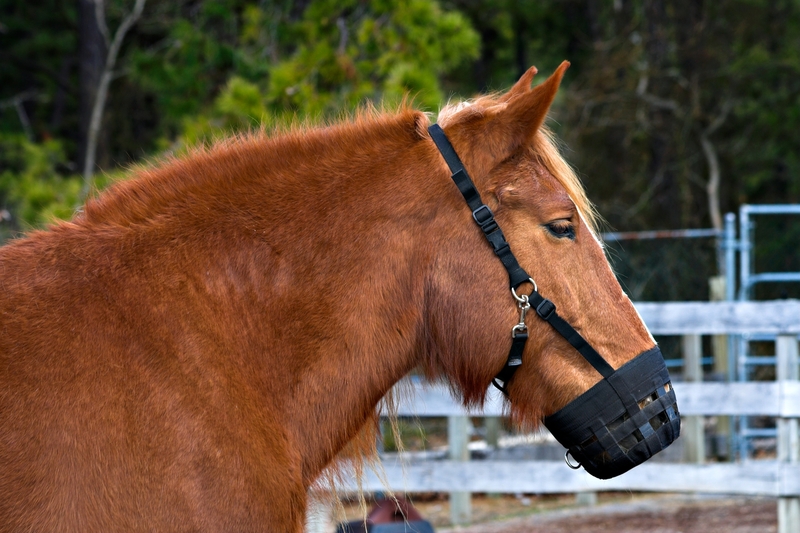 If you do turn out in pasture, try and limit the grazing to 1-2 hours per day and use a muzzle. Schedule your horse’s turn out according to when the grass is lowest in sugars; a general rule of thumb is to turn out four hours after sunset and before 10 a.m. the next day. Sugar content in grass is at its peak in the late afternoon on a sunny day and generally during times of stress such as periods of drought, growing, over-grazed. 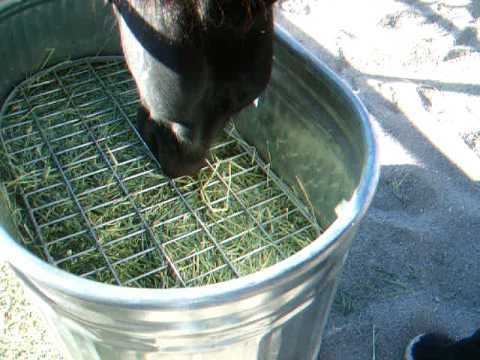 In severe cases of ECD turn out in a dry lot is best and use a slow feeder with low NSC hay to avoid stress and to mimic the natural feeding pattern of a horse. Some slow feeders I like are the Natural Grazer and the Nibble Net. But you can even make one if you are handy. Many IR and Cushings horses are overweight so they can usually get all calories they need from hay alone. Start with a feeding rate of 1.5-2% of Body Weight per day (approximately 15-20 lbs. 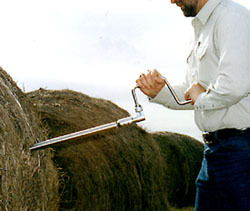 of hay for a 1,000 pound horse) and adjust it if weight is an issue. Be sure to balance the forage out with either a vitamin/mineral or ration balancing supplement. What kind of hay can you put in the slow feeder? Well, you can take small-grain hays and ryegrass, fescue and bromegrass right off the dinner plate as their NSC content can be 20% or greater. 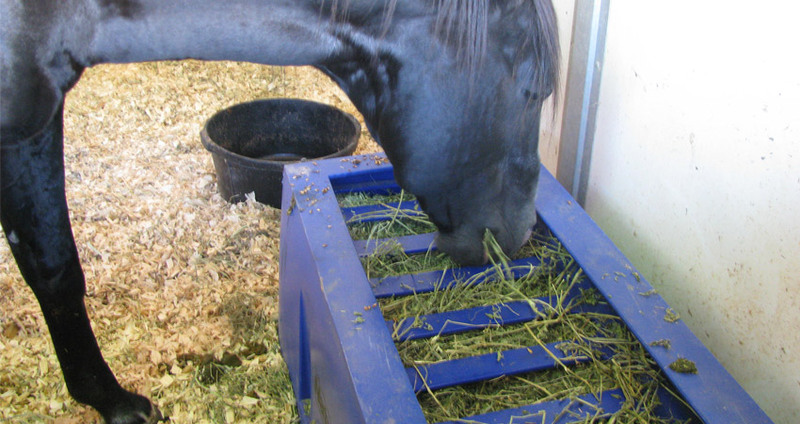 Alfalfa averages the lowest % NSC, making it an excellent choice for the insulin-resistant horse but it is also highest in calories so it would not be the best choice for a horse that has weight issues like obesity. Hay analysis is the only way to really know what’s in your hay. I use Equi-Analytical Labs to test my client’s hay and choose hay that has an NSC value of less than 12%. There are some options available to reduce the NSC value of the hay if your hay’s value is higher than this. If you soak it for 30 to 60 minutes that will remove some of the sugar, but remember to discard the water so your horse doesn’t get a big gulp of sugar water. 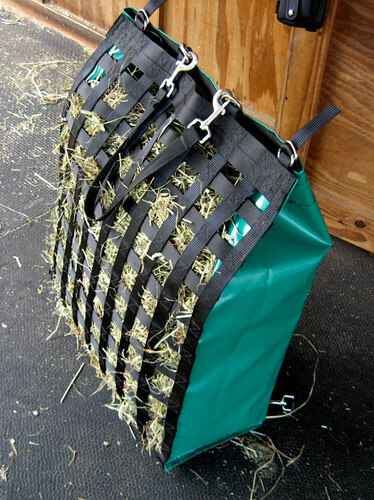 You can also use a hay steamer and reduce the sugars and NSC value. If you have a Cushings horse that is also a harder keeper this can be a challenge. Concentrates and cereal grains such as oats, corn, and barley can be very risky as they are very high in starch. What I usually suggest is a diet of low NSC hay and twice-a-day feeding of a mixture that includes 1 cup molasses-free beet pulp (soaked) with 3 tablespoons of flaxseed meal/oil or corn oil (this is for for a 1,000 horse). Beet pulp is really high in fiber, has about the same protein as a good grass hay, averaging 8 to 10%, however it is higher in calories than hay. Make sure to drain or rinse the excess water from beet pulp after soaking it for at least one hour before feeding it. This will significantly reduce the amount of sugar content. Flaxseed is chock full of Omega-3 fatty acid called alpha linolenic acid and this helps the body regulate insulin levels. Omega-3 fatty acids may also help prevent laminitis, a major problem in older horses with Cushing’s disease. This diet of hay and beet pulp mixture should make it easier to keep the NSC value of the daily diet to under 20%. Some horse owners like rice bran for adding calories. Although rice bran pellets are high in fat they are also high in NSCs so best avoided in horses with ECD. 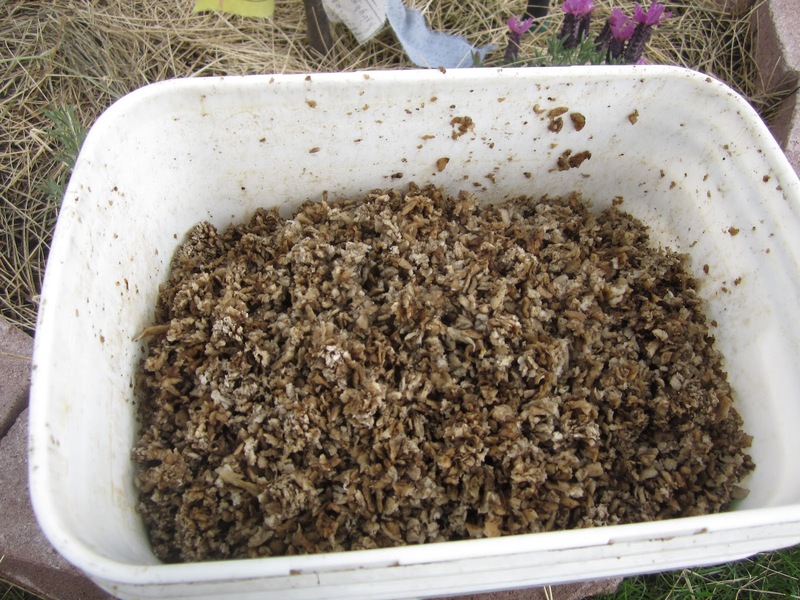 Many commercial feed companies offer concentrates that are low in NSC so you can feed one of those instead of the above beet pulp mixture. Make sure you feed according to the feed tag recommendations to assure your horse is getting the full nutrient profile provided. Ask your feed store or their representative for the NSC values of their feeds so you can choose a grain that compliments your hay value, if they don’t have them, switch brands to one that does. In addition to a low NSC diet, there are nutritional supplements recommended for the management of equine Cushing’s disease. Some research supports that additional dietary magnesium and chromium may help reduce insulin resistance by reducing insulin levels in the bloodstream. Adding 5,000 mg /250 lbs of body weight of magnesium per day and 5-10 mg/day of chromium is what is suggested. Quiessence® is a pelleted Magnesium and Chromium formula may help animals that are cresty-necked to reduce the crest, and may also help reduce the tendency to founder by supporting normal glucose metabolism and increasing peripheral circulation. Equine Sugar Balance by Equine Science- This a pelleted herbal blend that supports normal sugar metabolism. It uses Fenugreek to reduce blood glucose levels, Kelp to aid metabolic activity, Burdock which is high in chromium, zinc and magnesium, and other herbs for glandular support. Cushings Blend by Equine Science- This is also a pelleted herbal blend that helps balance the pituitary and hypothalamus gland using Burdock and Chaste berry to help balance the pituatary, Ginseng which supprts adrenal function, Kelp, Rosehips and Milk thistle. 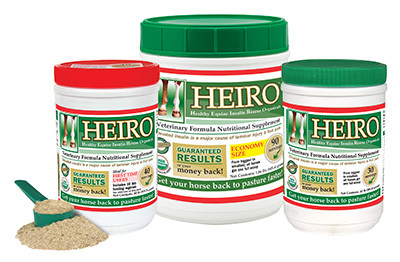 HEIRO: This stands for Healthy Equine Insulin Rescue Organical. It was developed by Dr. Frank Reilly, DVM, to help horses suffering from chronic sore feet with high insulin levels. After two years and hundreds of insulin tests, Dr. Reilly discovered the right combination and concentrations of organicals to make horses more on grass pasture where they were born to graze and play. 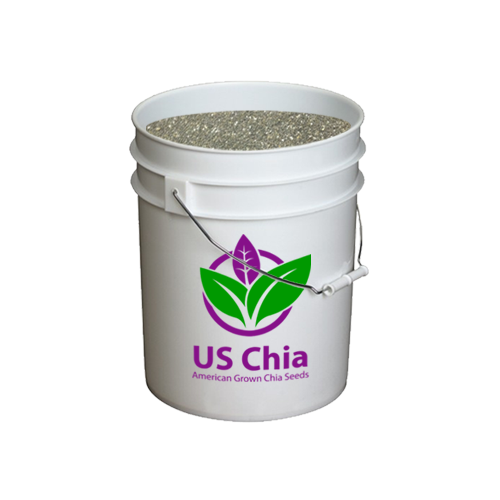 Contains USDA certified 100% organic herbs, magnesium, and vitamin E in a powder blend. Studies in humans (I know not the same as a horse but why not assume a similar reaction) show that joint supplements and iron both influence insulin negativity so avoid adding either to your ECD horse’s diet. Try to avoid sugary treats as well as apples and carrots. 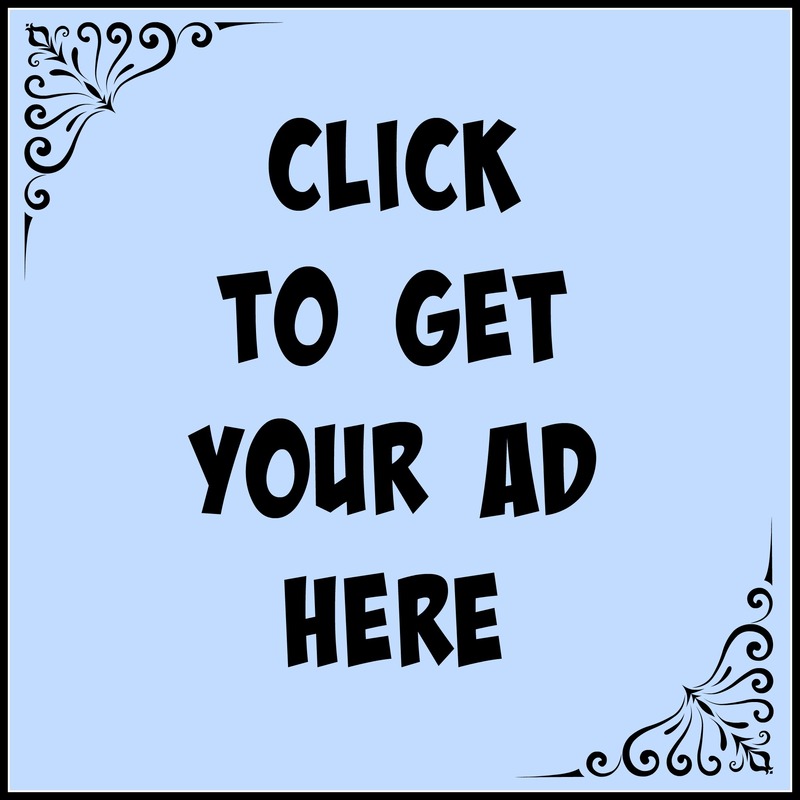 There are treats on the market specifically forlow NSC diets. If your horse can be ridden it’s good to provide regular exercise as this reduces blood glucose levels and helps with weight control. Your vet can offer you advice and support for your horse so be sure to work closely with them in developing a complete program for your horse’s comfort and health. In summary, we aren’t exactly sure why we are seeing a rise in Cushings disease in horses. Could be because they are living so much longer now and it’s an old horse problem. It wouldn’t be farfetched to think that an increase in the use of high-NSC feed diets and equine obesity might have contributed to this trend. The good news is that we can help these horses through better management of the equine diet, lowering incidents of obesity, and reducing equine stress through plenty of turn out and appropriate exercise. Hope you learned something useful and I wish you great riding and Happy Horses! You can receive a gussied-up PDF printable version of this article by clicking here.